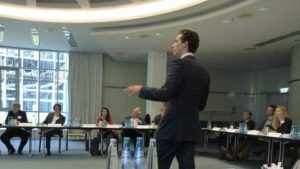 With 21 participants from all over Europe, United Europe’s first Entrepreneur Workshop on April 6 in Munich got off to a lively start. It was Juergen Grossmann who set the tone by reminding the participants that in Europe, “we are looking for people to change things, people with fire in their belly”. 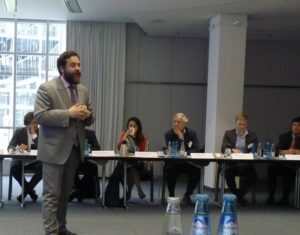 For this workshop, United Europe brought together experienced business leaders with young entrepreneurs from all over Europe to discuss the issue of ‘Founding and Funding in Europe’. The one-day event was hosted by Wacker Chemie AG, a globally operating chemical company, headquartered in Munich. In his opening speech, the CEO of WACKER, Rudolf Staudigl, explained how important innovation has always been for his company. With the establishment of the research center for electrochemical industry in 1903, Alexander Wacker laid the technological foundations for the start of Wacker Chemie in 1914. Nowadays, WACKER is a globally active company with some 17,000 employees, 25 production sites and annual sales of around €5.3 billion (2015). However innovation remains a cornerstone of WACKER’s strategy, together with customer intimacy, operational excellence and sustainability. Staudigl explained that “to be successful you don’t just have to be on the right path, you have to move fast on this right path.” Ambitious goals and strong commitment within R&D teams are key factors to stay focussed and successful. WACKER spends between 3-4% of its revenue on R&D. The R&D activities range from customer and market driven continuous innovations within current businesses to the development of new material and new technologies for future markets. The latter one in particular requires disruptive ideas. Asked whether radical innovations are coming from big companies or small start-ups, Staudigl said that small companies are good at creating new ideas, but they often lack resources to bring them to the next level. With the acquisition of two Biotechnology start-ups, within recent years, Staudigl gave an example of how a large company can benefit from start-up innovation power, whereas start-ups gain access to the resources of a big company. Another big success factor to develop new materials for future markets is the collaboration with partners across and beyond the chemical industry and with universities. Here Staudigl mentioned the development of a new generation of high energy lithium ion cells in cooperation with partners such as BASF, SGL, ZSW and BMW. Speaking of university collaborations, Staudigl gave the example of the foundation of the ‘Institute for Silicon Chemistry’ at the Technical University Munich in 2007. Such cooperation models allow a good balance between the basic research capabilities of a university and the application Know-How and market proximity provided by industrial companies. 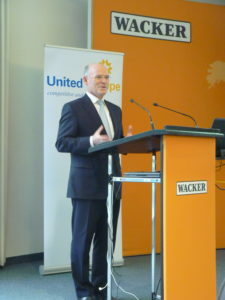 “We all love Europe – no question”, but Europe needs to improve its policy on research and development, Staudigl said. Better allocation of public funding for innovation and actual risk taking are key to secure Europe’s future in his opinion. This triggered a lively debate on whether and how public funding can ever really be used to support risk taking. Staudigl argued the problem isn’t initial funding. The second phase of funding is where European start-ups struggle to find sufficient support. In comparison to the USA and China, Europe also lags behind in people’s attitude towards innovation. Chinese entrepreneurs long for change and improvement which in turn leads to the required aggressiveness to be successful. In Europe, the focus too often seems to be on job security and quality of life rather than a need for change. Despite its high levels of education, Europe’s lack of urgency makes it difficult for start ups to find the right people, said Doris Hafenbradl, CTO of Electrochaea, a Munich based energy start-up. 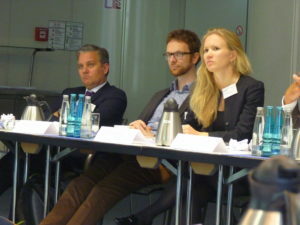 Maleachi Bühringer, a speaker at the workshop representing the younger generation of entrepreneurs, has been running Refratechnik Holding, a ceramic refractory company with 1400 employees, for five years. Now aged 32, Bühringer took a clear stand on what will have to change for companies to invest in Europe. “Transaction costs, employment costs and energy costs need to be reduced and a fair taxation system introduced”, he said. Different rules across Europe and insecurity about political developments make it hard for companies to pursue long-term investments in Europe. Further investment incentives and an easier way to do business were needed to keep European companies and attract further investments. Bühringer’s contribution kicked off an intense debate about what would be needed to put industry back on top of the political agenda. “The value of value creation”, as Staudigl called it, should be made clearer to politicians and to the wider public to create acceptance for business-friendly reforms. Promoting industry should start in the universities to have a lasting effect. Only then would it be possible for Europe to compete successfully with industry giants like the USA and China. Protectionism – which has been gaining ground in Brussels – is counterproductive and should be avoided. In a passionate speech, Dimitris Tsingos, an Athens based tech entrepreneur and former president of the European Confederation for Young Entrepreneurs, argued for “a European way of Entrepreneurship”. Instead of obsessively trying to imitate Silicon Valley, Europe needed to find its own way. It already had a booming start-up scene, Tsingos argued. It also presented some real advantages in comparison with other regions of the world. For instance, risk taking was much easier in a place with a stable and functioning social security network to fall back on, like in Europe. Still, Europe could do even better. “How many European companies can truly call Europe their domestic market?” Tsingos asked rhetorically. A true single market would allow start-ups to benefit from easy market access and the full potential of 500 million domestic customers. Rather than focussing on needing money, “start-ups should concentrate on acquiring customers,” Tsingos explained. Another measure would be to set up a European NASDAQ in order to facilitate second stage funding and trigger mergers and acquisitions. This, in turn, would result in more angel investors. Simple steps like making English the language of doing business in Europe would also support the creation of this single domestic market. 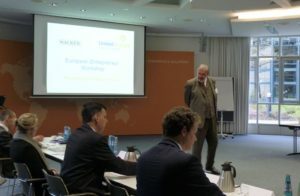 Kai Parplies, Head of Unit at the Directorate-General for Economic and Financial Affairs of the European Commission, explained the EU’s initiatives for boosting investment and supporting growth particularly in the less affluent member states. Such funding needed to be accompanied by structural reforms to enhance competitiveness, Parplies said. Also more efforts needed to be made to complete the single market for telecoms, energy and financial services. Only then would businesses and customers be able to reap the full benefits of European integration. The United Kingdom/The European Union: a clarified relationship or a fool’s bargain? Martin Brudermüller: What ‘s the matter with Europe? We need a new Europe of ideas! Start of our article series: Europeans – stand up!